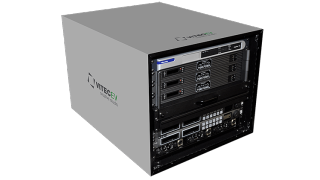 The What: VitecEV has launched an all-new product family designed to empower a broad range of enterprises to create and stream high-value content with broadcast quality. The What Else: With Creative Studio, nontechnical users can set up a turnkey video production studio anywhere in a building, campus, or offsite location. The modular solution includes lights, backdrops, and PTZ or robotic cameras, giving users their choice of shooting in either HD or 4K video. Templated production tools aid users in positioning lights and backdrops to increase the professional look of their videos. Creative Studio also includes functionality for prompting, recording, and monitoring of both audio and video, and storage for postproduction. With CORE, Creative Studio users can stream and monitor their video in real time to online services such as Wowza, Facebook, Ustream, and YouTube, and they can also archive the video in the cloud, ensuring that the content is always accessible. CORE's drag-and-drop interface improves setup for creating source, destination, and output channels for the streaming video. CORE allows encoder and decoder setup to pass through firewalls, eliminating IT involvement. "We designed Creative Studio and CORE specifically for enterprises and organizations whose mission is not broadcasting or media, but who nonetheless want to use high-quality video in their internal and external communications,” said Martin Vann, senior vice president and general manager, VitecEV. “Until now, their options have been limited: either create a dedicated in-house video team or hire an outside video production company. Both options are costly, and bringing in an outside production team can be disruptive to daily operations. "With the one-two punch of Creative Studio and CORE, our enterprise customers now have the ultimate flexibility—whether they want to live-stream a video message or store recordings for use later in postproduction. Creative Studio gives them the same professional video capture tools that broadcasters have been using for years, and CORE makes it effortless to get the video out to online audiences. The Bottom Line: VitecEV Creative Studio is a fully integrated video capture and streaming solution designed for use in an enterprise setting such as a conference room, and CORE is VitecEV's all-new cloud-based solution for streaming video to multiple online distribution platforms. VitecEV offers CORE as a monthly add-on service to Creative Studio users.